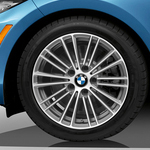 Does the BMW 2 Series Have an Electronic Stability Control System? In the mid-1990s the first electronic stability control system was introduced. BMW was one of the first auto manufacturers to utilize the system in their high-powered 7 Series. The results of the initial findings by drivers throughout the world were so impressive that BMW moved to include the system in all their new vehicles. Since then, BMW has continued to make improvements to cut down on accidents. The BMW 2 Series uses high-tech sensors in conjunction with the car’s computer to detect when stability is in doubt. Whether driving in Saint Louis or out on the open road, slick conditions decrease traction when the stability control system acts to brake the slipping tire or even to reduce the rpms in your motor to correct the slippage. Bring your BMW 2 Series vehicle to Autohaus BMW for an in-depth explanation of how your electronic stability control system works.